Background: The use of polypharmacy in the present day clinical therapy has made the identification of clinical drug-drug interaction risk an important aspect of drug development process. Although many drugs can be metabolized to sulfoxide and/or sulfone metabolites, seldom is known on the CYP inhibition potential and/or the metabolic fate for such metabolites. Objective: The key objectives were: a) to evaluate the in vitro CYP inhibition potential of selected parent drugs with sulfoxide/sulfone metabolites; b) to assess the in vitro metabolic fate of the same panel of parent drugs and metabolites. 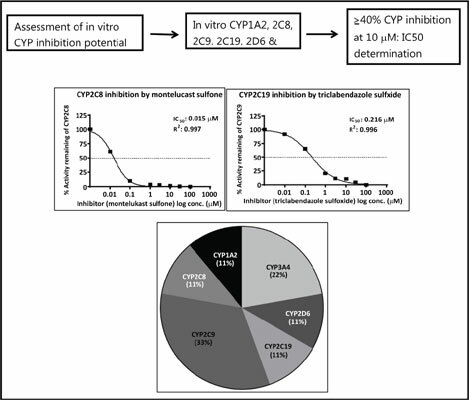 Methods: In vitro drug-drug interaction potential of test compounds was investigated in two stages; 1) assessment of CYP450 inhibition potential of test compounds using human liver microsomes (HLM); and 2) assessment of test compounds as substrate of Phase I enzymes; including CYP450, FMO, AO and MAO using HLM, recombinant human CYP enzymes (rhCYP), Human Liver Cytosol (HLC) and Human Liver Mitochondrial (HLMit). All samples were analysed by LC-MS-MS method. Results: CYP1A2 was inhibited by methiocarb, triclabendazole, triclabendazole sulfoxide, and ziprasidone sulfone with IC50 of 0.71 µM, 1.07 µM, 4.19 µM, and 17.14 µM, respectively. CYP2C8 was inhibited by montelukast, montelukast sulfoxide, montelukast sulfone, tribendazole, triclabendazole sulfoxide, and triclabendazole sulfone with IC50 of 0.08 µM, 0.05 µM, 0.02 µM, 3.31 µM, 8.95 µM, and 1.05 µM, respectively. CYP2C9 was inhibited by triclabendazole, triclabendazole sulfoxide, triclabendazole sulfone, montelukast, montelukast sulfoxide and montelukast sulfone with IC50 of 1.17 µM, 1.95 µM, 0.69 µM, 1.34 µM, 3.61 µM and 2.15 µM, respectively. CYP2C19 was inhibited by triclabendazole and triclabendazole sulfoxide with IC50 of 0.25 and 0.22, respectively. CYP3A4 was inhibited by montelukast sulfoxide and triclabendazole with IC50 of 9.33 and 15.11, respectively. Amongst the studied sulfoxide/sulfone substrates, the propensity of involvement of CY2C9 and CYP3A4 enzyme was high (approximately 56% of total) in the metabolic fate experiments. Conclusion: Based on the findings, a proper risk assessment strategy needs to be factored (i.e., perpetrator and/or victim drug) to overcome any imminent risk of potential clinical drug-drug interaction when sulfoxide/sulfone metabolite(s) generating drugs are coadministered in therapy. CYP inhibition potential, drug-drug interaction, Phase I enzymes, LC-MS-MS method, metabolic fate, metabolism.